Since I am not doing many festivals this spring/summer, I have not been such an intense production mode over the winter months. Two weeks ago I realized I was down to just one tree quilt….YIKES!! Time to get focused and make some quilts with trees for my ETSY shop. 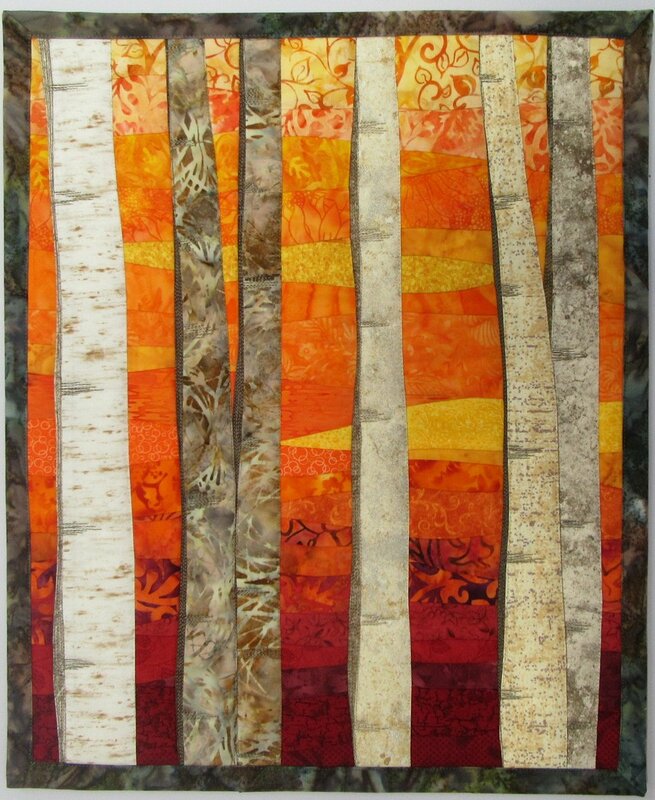 I have had a lot of positive feedback about my birch tree quilts. One I recently made only lasted a few weeks in my shop so I made a new one of that design. 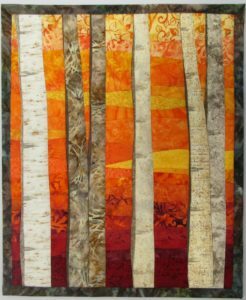 The new quilt is “Birch Trees 7 in Autumn” which is 15″H x 31.5″W. I often get inspiration from designs and colors from paintings and photographs. I saw a painting with rich reds and oranges. I added yellows to the palate mix and created “Birch Trees 8 in Autumn” which is 16″W x 20″H. The first of these quilts is more horizontal in shape and would look good over a dresser, cupboard or desk. The second is more vertical in size and would look best in a smaller space in an office, a hallway landing, or a smaller space in a bathroom. I need to take some context pictures for my ETSY listings to give people ideas for display locations. 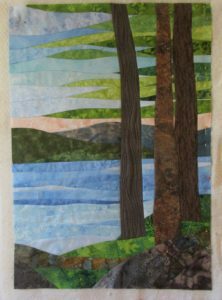 The third quilt I’m still working on is another design I have used in the past….a few trees to one side of the quilt in front of a lake with mountains and an interesting sky in the background. I made my last one in this design a year or two ago and it was much darker in over all color. This one I lightened up by making the lake with lighter blues and the sky almost with sunrise colors. Even the mountains and the foreground are a bit lighter in color. I’m still quilting this one but should be done in a day or two. It is called “Trees 22 in Spring by the Lake” which will be about 17″W x 24″H. These trees are the regular brown/grey guys! Some new features in this quilt are a combination of unique piecing in the foreground to depict rocks. I’m always experimenting with new ideas both in piecing and in colors. I like variety and trying new things. Keeping it fun! All three art quilts are pieced, not appliqued. The landscapes are still tricky to piece as it is all about the sequence of pieces going together. I haven’t heard of any compatibility problems. As usual, your pieces are gorgeous. It’s easy to forget how much work is involved in each one is because the first impression is of a simple scene but they’re so incredibly complex and beautiful. Thank you! I really want people to find new colors and details each time they look at one of my art quilts. Thank you for enjoying them as I hope others will too.